Lionsgate spent $2.9 million for a new trailer promoting The Hitman's Bodyguard, starring Samuel L. Jackson and Ryan Reynolds. Spending on broadcast for new creative fell considerably last week after skyrocketing the week prior. 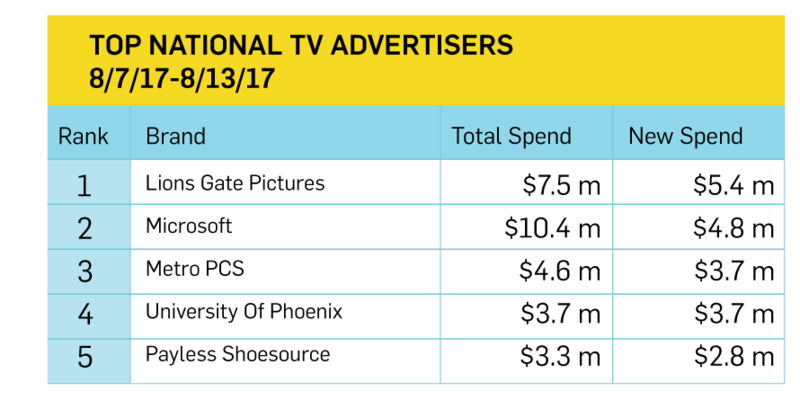 According to Kantar Media, advertisers spent some $135 million on national broadcast placement for new ads for the week of July 31-Aug. 6. Last week that total fell considerably, as 529 advertisers spent $78 million on national broadcast placement for new creative, closer to the $76 million advertisers spent on such placement during the last full week of July and good for nearly 10 percent of the over $800 million advertisers spent on national broadcast spending overall, according to Kantar Media. Of the spending on new creative, advertisers spent over $4.5 million on national broadcast placement during NBC’s America’s Got Talent, more than any other programming. ABC’s The Story of Diana, which marked the 20th anniversary of Princess Diana’s death, was not far behind, at $4.3 million. 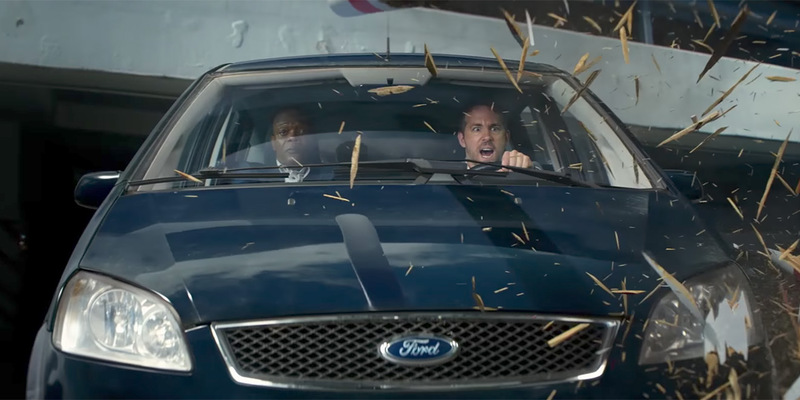 Lionsgate Pictures edged out the previous week’s top spender, Microsoft, spending $5.4 million on national broadcast placement for new trailers for The Hitman’s Bodyguard, The Glass Castle, Armed Response and My Little Pony: The Movie, over 70 percent of its total national broadcast placement budget for the week of over $7.5 million. Of that, the studio devoted nearly $2.9 million to a new 15-second trailer promoting the Aug. 18 release of The Hitman’s Bodyguard, starring Samuel L. Jackson and Ryan Reynolds. The studio devoted almost as much, just over $2.5 million, to promote its adaptation of the 2005 Jeannette Walls memoir, The Glass Castle, while spending just $15,000 and $11,000 on national broadcast placement for Armed Response and My Little Pony: The Movie trailers, respectively. Hitmans Bodyguard 807 from Kantar Media US on Vimeo. The Glass Castle 807 from Kantar Media US on Vimeo. After devoting the entirety of its $9.9 million national broadcast placement budget the week prior, Microsoft spent $4.8 million of the over $10.4 million it spent on national broadcast placement overall on new creative last week. Of that, Microsoft devoted $606,000 to placement during America’s Got Talent, more than any other programming. Microsoft 807 from Kantar Media US on Vimeo. Metro PCS spent nearly $3.7 million on national broadcast placement for a new spot promoting the network’s unlimited 4G LTE data plan, 79 percent of the over $4.6 million it spent on national broadcast placement overall. Like Microsoft, Metro PCS went big on America’s Got Talent, devoting $808,000 of its new creative spend to placement during the program. Metro PCS 807 from Kantar Media US on Vimeo. University of Phoenix spent the entirety of the nearly $3.7 million it spent on national broadcast placement last week on “To My Great-Granddaughter,” a new spot in the “We Rise” campaign, which creative agency of record 180LA launched in February of 2016. In the ad, an immigrant grandmother addresses the opportunity she helped pass along to her great-granddaughter, thanks in part to the for-profit university. The spot, which runs in both 60 and 30-second versions, debuted on Aug. 7 and ran a total of 531 times nationally and 188 times on local networks last week, according to Kantar Media. The 30-second version is also running as an online ad. The University of Phoenix devoted $872,000 to placement during The Story of Diana, more than any other programming. Payless Shoesource devoted over $2.8 million of the nearly $3.3 million it spent on national broadcast placement last week, around 85 percent, to new creative promoting a summer sale. Of that, $505,000 was shoehorned for America’s Got Talent, once again making it the top destination for an advertiser’s spending on new creative. Payless 807 from Kantar Media US on Vimeo.